For Christmas, Sam's FIRST, I really wanted to make him something. I love to make gifts. The thing is, I waited till last minute to do something for Sam. I looked through my books and everything either required time or to buy a lot of supplies. 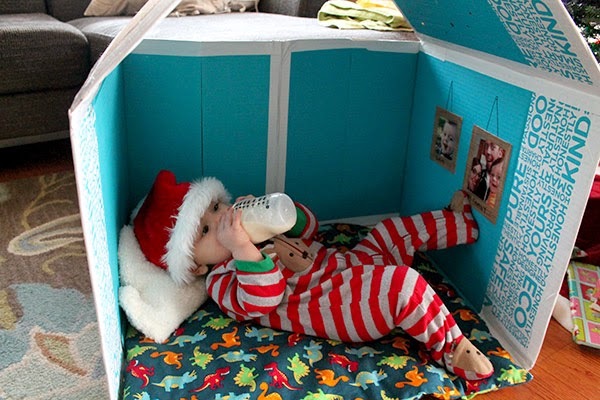 I then searched on Pinterest for DIY baby toys and I came across this cardboard house and I KNEW that's what I wanted to do! It'd be a fun little place just for Sam. 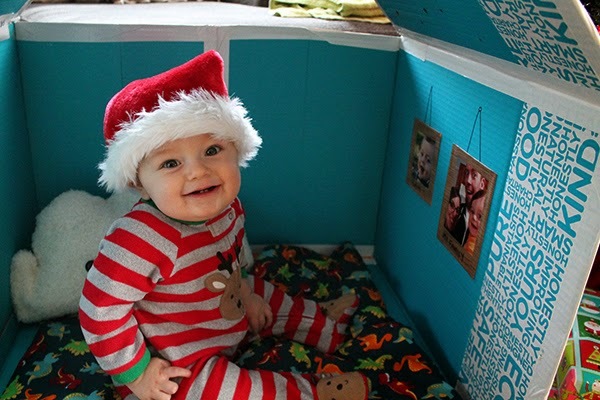 I knew my Honest diaper boxes would be great. Not only are they big, but they have a nice design on the outside and is teal on the inside. I got a roll of white duct tape to piece everything together and to contrast with the colors of the box. I modified the house a little because I needed to use two boxes instead of one. 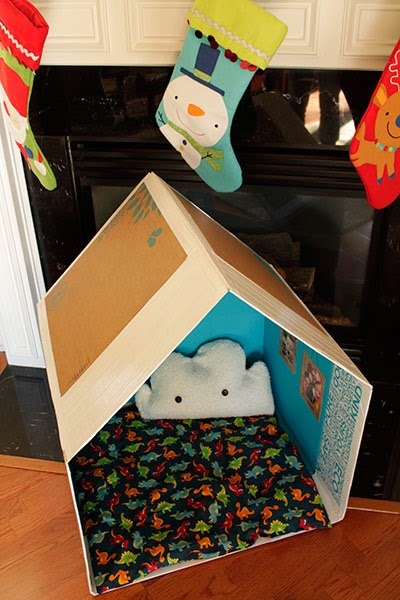 This house also folds up so we can put it away easily. Once put together, I put up a couple pictures of Sam and us and I put start stickers on the ceiling. I also made a little mat for the bottom. And I couldn't help but make a cloud pillow just like the one in the tutorial. 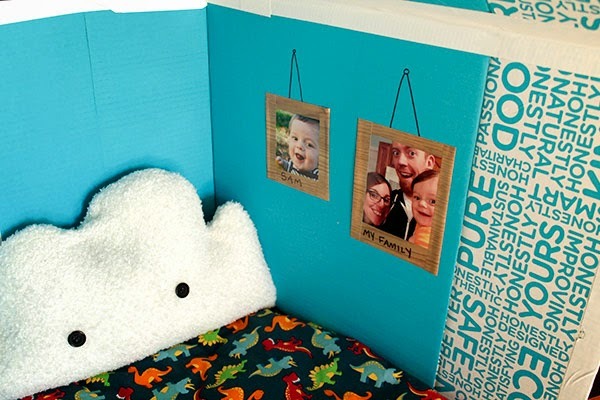 I had left over fuzzy white fabric that was perfect for a cloud. If Sam really likes being in his house, I was thinking maybe putting up a curtain so he can have some privacy. I'm really happy how it turned out! It was a fun project. It's hard to tell if Sam is into it since he's still overwhelmed with Christmas and he's just a bit young. I like to give him his morning bottle in the house. Such a good idea! Sam is such a good boy hanging out in there. I can't get Roman to stay still ever. But maybe if I make him one of these!! It's more beautiful than the tutorial! I am so jealous of his elegant expensive house..hehe!